The next time your kindergartener decides to makes up a new story, challenge him to a whole new method of storytelling—as a cartoon! Teach your child how to work in all the essential parts of a story (beginning, middle and end) as he engages his creative mind. Completing this fun cartoon project is sure to strengthen his fine motor skills as well. Ask your child to tell you the story. After he tells it, discuss the various parts—beginning, middle and end. Who is the main character? What problem is he trying to solve? What challenges does he face? How does he succeed? Now help your child figure out which characters need to be in each cartoon panel. What does each character look like? It might help your child to create a character sheet so that he can keep track of who has a cape, who has a magic wand, or who can fly. Time to get grubby! How many characters are in each cartoon panel? Assist your child in making one fingerprint per character. Take the time to wash the ink off little fingers so that the cartoon doesn’t get smeared. Bring out the fine tip markers so that your budding cartoonist can add arms, legs, capes, and other gadgets to each character's fingerprint and bring his story to life. 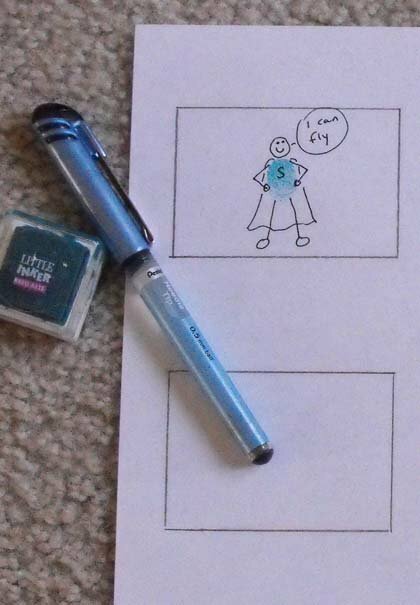 To extend this activity, make a special place on the refrigerator to run your child’s comic strip. New ones can be added regularly as you either recycle the old or save them in a special folder.